You can learn a lot about an area, and about the families that lived there, just by looking at the numbers. 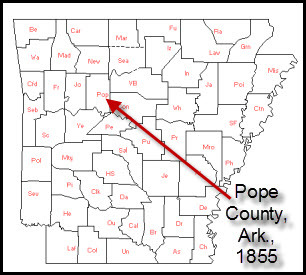 But what was Pope County like, say, in the years just before the Civil War? Where are the stories from, oh, maybe 1855? For that, we have to look at other numbers. Numbers like the ones assigned by the Probate Judge of Pope County, Arkansas, in one court session in January 1855. So what do numbers like this tell us? Every one of those five children would have required a guardian in January 1855, when H.A. Howell was appointed. Yet only three children were named in the guardianship. So we know that not only did at least one parent die between 1850 and 185514 — but two children did as well. So where did the property come from that required the appointment of a guardian? The death of a grandparent, perhaps? And maybe finding the answer to that will explain the move to Kentucky by 1860. In the numbers set by the court as “sufficient,” we get an idea of the relative economics of these families: the guardian of the Dare children had to post surety in the amount of five dollars, while the guardian of the Howell children — their own mother — had to post surety in the amount of $10,000. The guardian of Elijah Brown posted $60; the guardian of Augustus Logan, $7,000. And those numbers alone tell us that Pope County wasn’t all the same demographically in 1855 — that it had a very wide gap between its rich and its poor. A fact that may help us place our families in context when we find them in Pope County in that time period. One moment in time, frozen in the records of the Probate Court. And stories that can be lost if we don’t think to look for them. Very interesting post, Judy. Thank you! Thanks for the kind words, Ginny!